In the winter months, we often opt for cozier foods like soups and casseroles for that extra comfort. 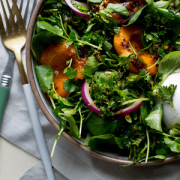 We wanted to whip up a this Roasted Tomato & Squash Salad that features a mix of warm vegetables, since the temps are ridiculously low right now. Butternut squash can be found almost anywhere in the fall and winter. It’s a tasty root vegetable that is loaded with vitamin A and vitamin C. Combine that squash with roasted tomatoes, and you have a vitamin C and potassium powerhouse. DIY salad dressings are everything. Most store-bought dressings (especially those shelf-stable ones) are loaded with additives and excess sodium. 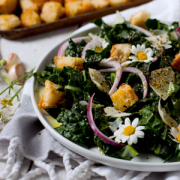 By making your own dressings, you can get a boost on more nutrient rich ingredients, while controlling sodium intake. This dressing has a white bean base that adds creaminess, without an excess amount of fat. Adding in cilantro (or whatever herbs you love) helps to bring out the flavors of our vegetables! Let’s get to it! Start off by preheating the oven to 450F. Add the squash, tomatoes, and garlic to a parchment paper-lined baking dish. Drizzle the olive oil, vinegar, and maple syrup over all the ingredients and massage so all is evenly coated. Pop into the oven for 30 minutes and while that’s happening, add all of the ingredients for the dressing into a food processor. 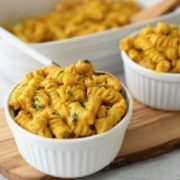 Once the baking is done, allow ingredients to cool, and remove the garlic cloves from the skins and throw into the food processor and blend with the rest of the dressing ingredients. Pulse until a creamy consistency is reached and set aside. In a large bowl, add your greens, the roasted tomatoes + squash, and top with the dressing. Enjoy! We encourage you to add your favorite proteins and/or whole grains for a more complete, satiating meal! Do you like to make your own salad dressings? What do you think of our white bean base for this Roasted Tomato & Squash Salad? Let us know what you think in the comments below! 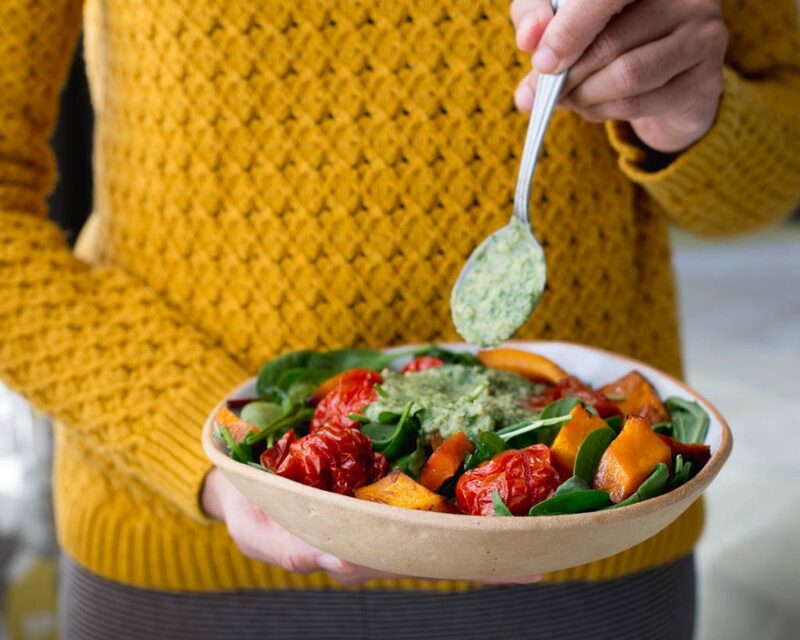 In a large bowl, add your greens, the roasted tomatoes + squash, and top with the dressing. Enjoy!